As businesses continue to get excited about machine learning and AI to unlock data. But make no mistake next year the focus will be on GDPR. Especially considering the penalty for not complying can lead to fines of up to €20 million or 4% of global annual turnover. On May 25, 2018, the General Data Protection Regulation (GDPR) will come into effect in the European Union. This new, sweeping regulation gives consumers control of how organizations use their personal data, requires opt-in consent, and makes it necessary for companies to remove their information from databases almost instantly if they ask for it – which presents enormous technical difficulties. Businesses will no longer be able to claim ownership of customer data, instead, they will be custodians of it. This fundamentally changes how a business handles this data. The regulation will demand complete transparency across all data ‘actions’ and provide this information to the consumer almost instantly. Essentially, any company that does business in the EU, must be GDPR compliant, regardless of Brexit. Whether a company is already operating in the European Union or has expansion plans there in the future, the upcoming GDPR rules will have a profound impact on how all organizations handle, manage, and use consumer data. 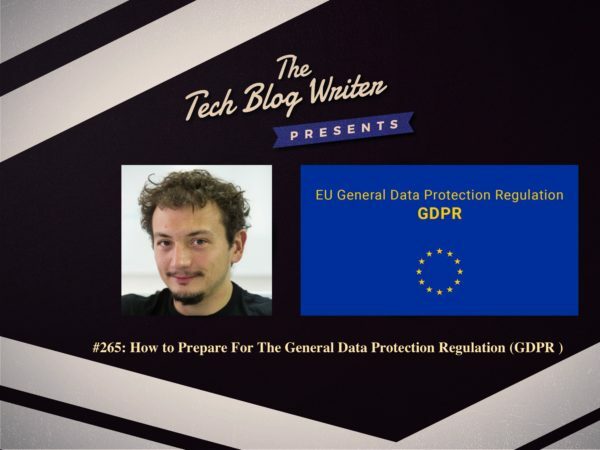 I invited Florian Douetteau CEO at Dataiku to discuss his thoughts on the impending GDPR regulation. How a company should prepare for GDPR – even if they don’t plan to collect EU customer data. What are the best practices for data management? Florian is Dataiku’s Chief Executive Officer. Florian started his career at Exalead, an innovative search engine technology company. There, he led an R&D team of 50 brilliant data geeks, until the company was bought by Dassault Systemes in 2010 for $150 million. Florian was then CTO at IsCool, a European leader in social gaming, where he managed game analytics and one of the biggest European cloud setup. Florian also served as freelance Lead Data Scientist in various companies, such as Criteo, the European Advertising leader. Dataiku develops a collaborative end-to-end software platform called Data Science Studio (DSS) that companies use to accelerate the development of in-house business and predictive solutions. This results in a significant increase in efficiency and productivity for the company’s data scientists, business analysts, and product managers. Next Post264: Pollfish - Behind Enemy Lines – What Are Your Competitor's Users Thinking?